The tension escalating between Bnei Brak residents and illegal refugees came to a head Saturday when two Sudanese men were attacked with knives and clubs by a gang of Israeli youths. An initial police investigation found that they were assaulted because of their ethnic origin. One of the men was stabbed several times in his abdomen and back, suffering moderate injuries. The other suffered minor injuries after being beaten. A Magen David Adom emergency crew tended to the victims before evacuating them to Sheba Hospital in Tel Hashomer. A police investigation found that the two Sudanese nationals, both in their early 20s, were sitting at a public park in the Pardes Katz neighborhood around 5:30 pm when a group of three to five Jewish youths passed by and started a conversation with them. 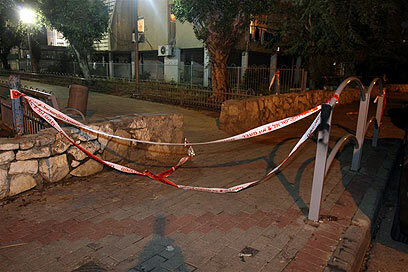 Suddenly, one of the Israelis took out a knife and stabbed one of the victims, who consequently collapsed on the sidewalk. Meanwhile, the other members of the group attacked the remaining Sudanese with clubs. Following the incident, police began scanning the area for the suspects. Efforts were also made to collect information that might reveal the attackers' identities. A resident of Dangur Street, where the incident took place, said that he was not surprised by the unfolding of the events. "Over the past year there has been great tension between the Sudanese walking in groups around our streets, spreading fear among the neighborhood residents and our daughters," he said. "It was only a matter of time before something like this happened." Prompted by the growing numbers of of Sudanese refugees in the neighborhood, Bnei Brak rabbis issued a statement last October, calling on residents to avoid renting homes to Africans, and warned against a "spiritual danger." Around the same time, a whistleblower hotline threatened to expose the names of Jews renting property to foreigners, in hopes of shaming them into stopping. See all talkbacks "Police: Sudanese men stabbed by Israeli gang"